Penkoted grass seed mixture. Provides quick, dense grass coverage. Formulated and mixed specifically for your region of the country. For use in sunny to partly shaded areas. 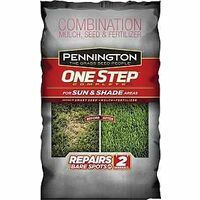 Professional grass seed mixture. Provides quick dense coverage. Formulated and mixed specifically for your region of the country. For use in sunny to partly shaded areas. Specially formulated improved turf grass varieties for full sun or shade. Spreads quickly to repair thin and bare spots. Grows a thick green lawn in sunny or shady areas. Versatile mix. Endophyte enhanced.